Map of the Bamangwato Country to Illustrate Captn. Patterson's Paper. This is a fascinating example of the 1879 Stanford Map of the territory of the Bamangwato (BamaNgwato) people of Botswana, Southern Africa. 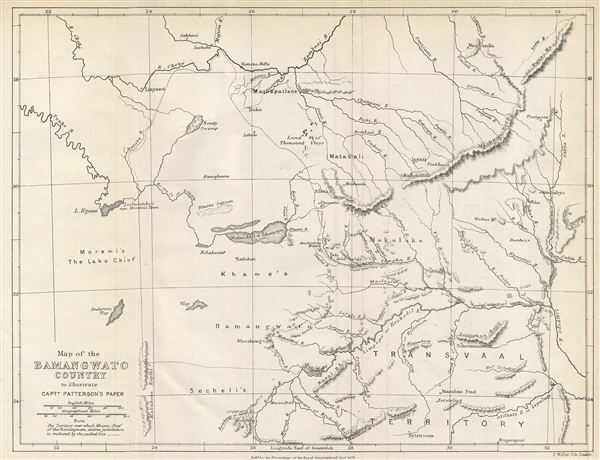 Centered on the Makarikari Salt Lake, this map covers from Lake Ngami to Fura Mountain. Based on Captain R. R. Patterson's papers, the map identifies various towns, rivers, lakes, peaks and various other topographical details. The Transvaal, Chief Moremi's lands, and King or Chief Khame's (Khama's) territory are noted. Also identifies the capital town of Shoshong. Relief is shown by hachure. This map was drawn by A. K. Johnston and published by e. Stanford and printed by e. Weller, as part of the Proceedings of the Royal Geographical Society and Monthly Record of Geography, Vol. I, in 1879.